When the Type I Karmann Ghia was introduced to the public in the mid 1950's, it generated tremendous excitement for VW enthusiasts and owners. This beautifully bodied 2 seater Coupe was designed by an Italian design firm and built by hand by a German coachbuilder, however, underneath this racy body was the proven mechanicals of the VW Beetle. The KG Coupe sold very well and in 1957 the KG Cabriolet (convertible) model was introduced and sold even better. Since the Beetle and KG were built on the same chassis design with identical running gear, it was naturally classified the Type I. The Transporter series were considered the Type II, so appropriately, the next line of cars would be called the Type III, and so it was. When VW decided to approach the middle class marketplace with a new line of cars in the late 1950's, they had already decided to continue the tradition of a Coupe and Cabriolet with this new line. 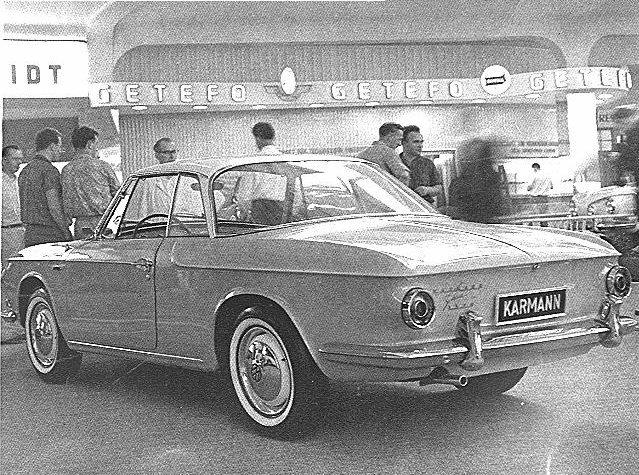 Karmann display with T34 Coupe. The new line was officially introduced at the Frankfurt Auto Show in September 1961, and the new cars were an immediate success. They were larger, faster, stronger, roomier, and better equipped, all important features for middle class needs. The Frankfurt Show unveiled the VW 1500 models (designated VW 1500 because of their new 1500cc engine redesign, which was 25% larger than the current Beetle & KG engine), including the 4 seater Sedan (commonly known as the Notchback) & 4 seater Cabriolet, the Variant Estate Wagon (Squareback), and the 2 seater Karmann Ghia Coupe & Cabriolet. At the time, VW believed both Cabriolet models would be ready for mass production, but a few months later they discovered that Karmann could not produce the Cabriolets at a cost that would be competitive with the market. There were structural problems with the Sedan & Coupe that required extensive modifications, which would increase the selling price dramatically. 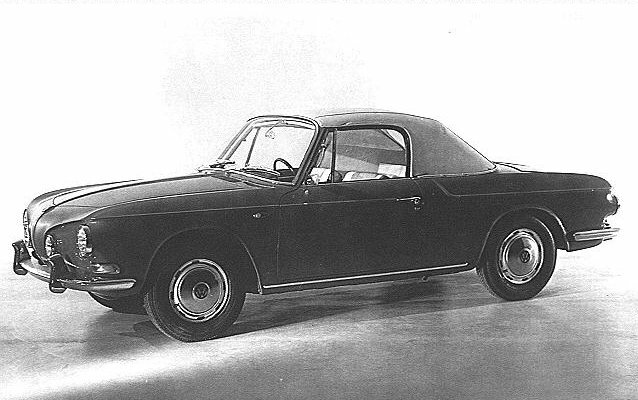 VW decided to shelve both Cabriolets in early 1962, even after distributing sales brochures and price lists and including these open models in the VW 1500 introduction ceremonies. These Cabriolets were to remain prototype designs, with only a few dozen built by hand for shows in 1961, and only a couple remaining in the world today in the VW & Karmann Museums. with its own names including "Razor's Edge Ghia" (Great Britain), "Der Grosse Karmann" (the big Karmann, Germany), and "European Ghia" (USA). A car of many names to be sure. be difficult enough to find on a VW that was officially exported the USA in the 1960's, imagine how difficult it must be to locate parts since the Type 34 was never exported to the USA! Although the Type 34 was exported to many countries around the world like Canada, England, Brazil, Sweden, Australia, Japan, Singapore, New Zealand, and the Philippines, it was never officially available to USA VW dealers. 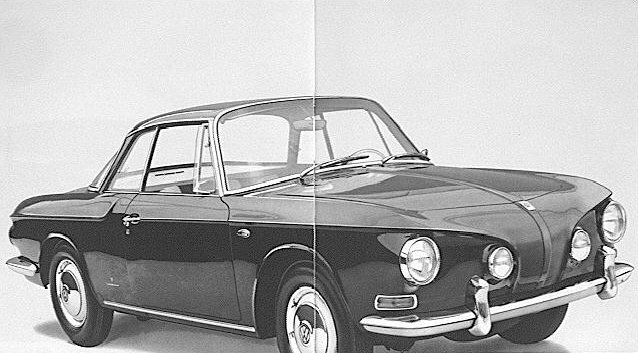 The majority of Type 34 historians believe VW chose not to export to the USA because the Karmann assembly line would not be able to keep up with US demands, and that VW recognized that Americans might not choose to pay for an imported (and quite expensive) Coupe that looked similar to the Chevrolet Corvair. Some believe that VW simply decided that the Type 34 would not be a high production automobile from the beginning, and therefore they would not produce the necessary supply of spare parts that would be required to service the USA dealerships. Whatever the reasons, it created a huge demand for the Type 34 in the USA. Military servicemen and American tourists in Europe bought Type 34s and US VW dealerships arranged for European VW dealers to resell Type 34s, creating a "gray market" for Type 34s in the USA. The Type 34 was built from September 1961 through July 1969, although the earliest known Type 34 was built in early December 1961. There were a total of 42,505 Coupes built, all at the Karmann factory in Osnabruck, Germany. Unbelievably, there are known to be only about 1000 in existence worldwide today, although there many be as many as 2000 laying in storage around the world. From existing databases, there are 45% in Germany, 30% in the USA, 10% in Great Britain, 2% in Canada & New Zealand, and 10% in the rest of the world. The majority in the USA and Great Britain are unrestored original drivers, unlike most of the Canadian and German Type 34s that have extensive rust damage and highly restrictive registration laws for safety. Typical costs for an unrestored original Type 34 on the West Coast USA are from $1000 $2500 with higher prices on the East Coast due to the harsher conditions. Typical values for an accurately restored to original (non concourse) Type 34 is from $5000 $10,000 in the USA and much higher in Europe. Type 34s can be best classified into five categories based on year of production and engine size: early 1962, late 1962 63, 1964 65, 1966, 1967 69. Early 1962s are the most desirable for collectors because of their rarity and unique pre production features. All 1962 63s were fitted with a 1500cc engine and single side draft carburetor. All 1964 65 models were fitted with the same 1500cc engine but had dual down draft carbs and dome topped pistons (termed "1500 S" models). Models for 1966 were fitted with the new 1600cc dual carb engine. Of course, 1967 69 models featured the new 12 Volt electrical system with the 1600cc dual carb engine. The Type 34 is a highly collectible model for many reasons including its ultra low production volume of 42,505 in only 8 production years, handbuilt controversial design, top of the line status, limited worldwide distribution, high performance, excellent handling, and luxuriousness, not to mention its scarcity. Type 34 owners tend to be non VW enthusiasts or collectors, but simply regular people that enjoy its design, wonderful performance, and unique charm coupled with care free VW reliability. It will be assured of long term collectors status, especially for those models that are in good original condition or those that have been accurately restored to original condition. The cost of buying one today is very low, so now is a great time to buy one for the future before it's too late!